The Land of the Rising Sun is equal parts unique enigma and tourist haven, offering an incredible mish-mash of cultures, classes, traditions and technologies. A holiday to the island nation requires visits to the iconic locations of Tokyo and Mount Fuji, but scratch the surface and the hidden gems of this beautiful country will take your breath away. Although Mount Fuji is symbolic of Japan, Mount Aso is more than worth a visit. 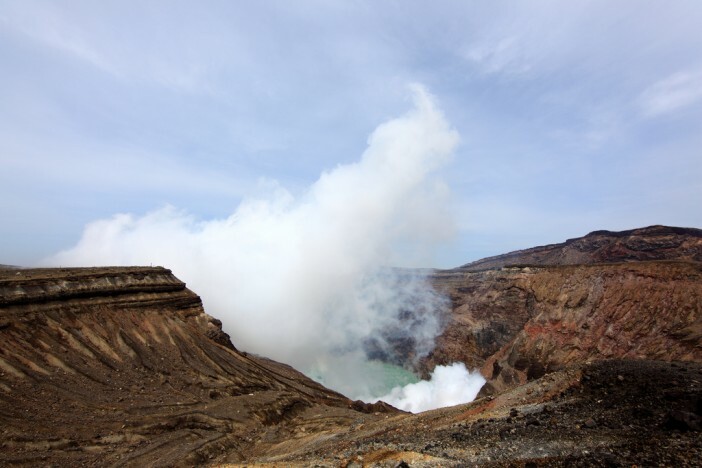 At 1592m above sea level, Mount Aso is the largest active volcano in Japan, offering an ever-changing landscape and unique atmosphere. The volcano last erupted just 10 years ago, making it increasingly popular with thrill-seeking tourists who are keen to witness the splendour of an active volcano. A popular campsite has opened at the foot of the mountain, with locals offering horse rides through nearby Kusasenrigahama. Natural hot springs have also developed in the area, which are much loved by visiting poets, seeking inspiration from their beautiful surroundings. Whilst the Japanese art of Origami seems to have a certain obsession with the crane, you can see the water bird in all its real life majesty in the Inba Marsh, part of the beautiful Inba Tenga prefectural national park. For more than 50 the marsh has been protected as a host of stunning wild birds. The unique park spans the borders of seven different Japanese municipalities, giving it a certain sense of cultural juxtaposition. Designed to protect the capital city Tokyo from flooding during the Monsoon season, The G-Cans Project is a huge drainage system built under the city of Saitama. Taking more than 15 years to build, the system was only completed in 2009. Comprising of tunnels running over 100km, 213ft tall silos and the Underground Temple, an 83ft tall and 580ft long pillared main tank. The system is capable of pumping over 200 tons of water every second. Free tours of this awe-inspiring feat of engineering are available, but non-Japanese speakers are required to bring a translator for safety reasons. The largest hot springs in the city of Toyama, Unazuki-onsen offers incredible, relaxing green waters and views over the Kurobe Valley. The hot spring was an accidental by-product of the development of a local power source, although the water remains pure and clean. Visitors to the hot springs can enjoy a dip in the beautiful waters or watch the 60 degree Celsius water geyser in front of the Unazuki-onsen station. The region even produces its own beer using water sourced directly from the local Kurobe-gawa river. A small island, located in between Okayama and Takamatsu; Naoshima has been revitalised following the failed fishing industry into an ‘art island’. Billions of Yen were spent turning Naoshima into a unique island-wide art installation. Alongside the Museum of Contemporary Art, built by architects Ando Tadao, the island plays host to a wide range of al fresco art installations designed by artists such as Yayoi Kusama and Cao Guin Qian. Best enjoyed by bicycle, Naoshima is a unique art treasure hunt challenging visitors to criss-cross the island seeking out the al fresco installations and sculptures. For a fantastic range of cruise holidays to Japan visit our dedicated page, here, or call our helpful sales staff on 1300 857 345. Images sourced via Flickr Creative Commons. Credit:slakrhackr, stan chow. Koshy Koshy, TANAKA juuyoh.